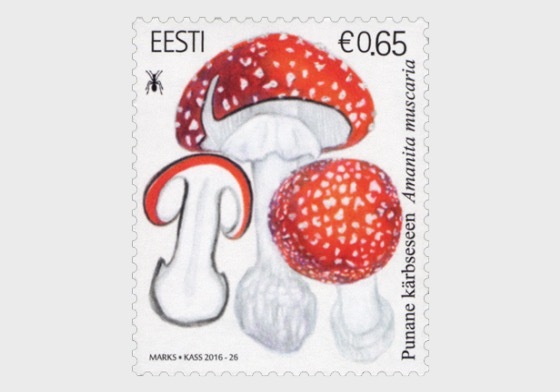 ly agaric (Amanita muscaria) is the most common species of agaric in Estonia that mainly grows in birch, spruce and pine stands. Fully grown, the cap of the mushroom is 8–18 cm in diameter, bright red in colour and covered in white to yellowish removable warts. As the fungus grows, the number of warts may decrease as they may be washed away by rainfall. The gills are yellowish-white and free. The stipe is strong, yellowish-white is colour, 5–20 cm high and has a bulb at the base that bears veil remnants. The ring is wide and flaccid. The flesh is white and yellowish under the cap. Although it is poisonous, deaths resulting from the fly agaric are extremely rare. A fatal dose has been calculated as 15 caps. The name “fly agaric” is derived from the ancient use of an infusion made of the mushroom as an insecticide (when sprinkled in milk). Fly agaric is consumed as a drug due to its psychotropic effects. There is no antidote for poisoning caused by the mushroom, thus, people who have ingested a fly agaric are treated as for general poisoning.